I finally got to enjoy what is often voted the best Greek food in town. I went to Christos on a Saturday afternoon with J, with whom I was going on a second date. Last weekend, he proposed we get lunch and check out Josef Sudek’s photography at the MIA. I chose Christos right away given the museum’s brilliant proximity to Eat Street (and because a certain food critic at MSP magazine suggested as much). It was a great choice. Christos at noon on a Saturday looks like a Mediterranean getaway. It has a large, comfortable dining room with an open kitchen, and the tall ceilings, white walls, ample plants, and big windows bring in lots of sunshine, like you’re hanging out in the courtyard of your seaside hotel (wearing a sweater and snowboots to ward off the Minnesota winter, of course). The place was busy, and at that hour, you get to eat alongside lunching ladies and families young and old. There’s something very “of the city” about it, and it couldn’t be any more different from their location in St. Paul’s neoclassical train station, Union Depot, which makes you feel like you have but a few minutes to feed your lifelong love falafel and grape leaves before dashing off to meet your train. In any case, my date and I shared spanakopita, mousaka, dolmathes (grape leaves), melintzanosalata (roasted eggplant dip), avgolemono (soup described as “traditional egg-lemon delight”), and milopita (glazed apple slices baked in phyllo with ricotta and cream cheese). All of the food was fresh, served at the perfect temperature, attractive, and satisfying. It looked and tasted like the Platonic version of Greek food. The only thing I questioned was the phyllo dessert served sitting in a pool of syrup, which is not my favorite place to keep a flaky pastry. Is this how it’s supposed to be? We also had Retsina with our meal, the allegedly harsh tavern wine that gets its pine flavor from the resin traditionally used to seal whatever vessel wine was stored in. I’d never tried it before and was clearly curious, so the server offered a taste of the two types served by the glass: Tsantali and Achaia Clauss. (They have three more kinds served by the bottle.) I was impressed with how easy it is to drink. We settled on Achaia Clauss and drank it right down. At one point, I casually said something to J about the music I play while I cook. For a long time, I cooked while listening to records — Beatles, Simon & Garfunkel, Carole King. Stuff like that. Thinking nothing of it, J said, “Ella Fitzgerald is my cooking music” as he dug into another portion of our meal. And I think it was at that point I knew he was someone to pay attention to. This entry was posted in Minneapolis Restaurant Reviews, Tete a tete (That's French for "dating") on February 24, 2010 by Carrie. The following post ran in the February-March issue of my Column The Sense of Taste. Readers coming to this site from the link in the column, please see the post before this one for many additional poaching tips. Although we’ve spent many hours together in the kitchen, the humble little egg still hasn’t given up all of its secrets. This isn’t to say that eggs are difficult to cook. They’re challenging only in that they provide an entire curriculum of cooking techniques. Eggs are both casual and refined. You can have them with a cup of coffee or a glass of wine. They take you to France, Italy, Spain, Asia, and a diner in a small American town. They satisfy your teeth both savory and sweet. With minimal cost, they elevate other ingredients or take up a starring role in breakfast, lunch, and dinner. With a little dedication, cooking with eggs can become one of the most important techniques in your kitchen. With Valentine’s Day upon us, I’d like to suggest a romantic morning recipe from classic French cooking repertoire, Oeufs en Meurette, or poached eggs in red wine sauce. If you make eggs for someone for breakfast, it means you care about them. If you make this egg dish for someone, your hearts might permanently join together right there at the table. With the first bite, the egg yolk oozes into the rich red wine sauce and the crevices of the crisp, garlic-laced bread. By serving it, you’re tapping into a vault of sensual French cooking and saying that you want to experience more of the world together. Poached eggs with red wine sauce is a sensual and beguiling gift of your affection. 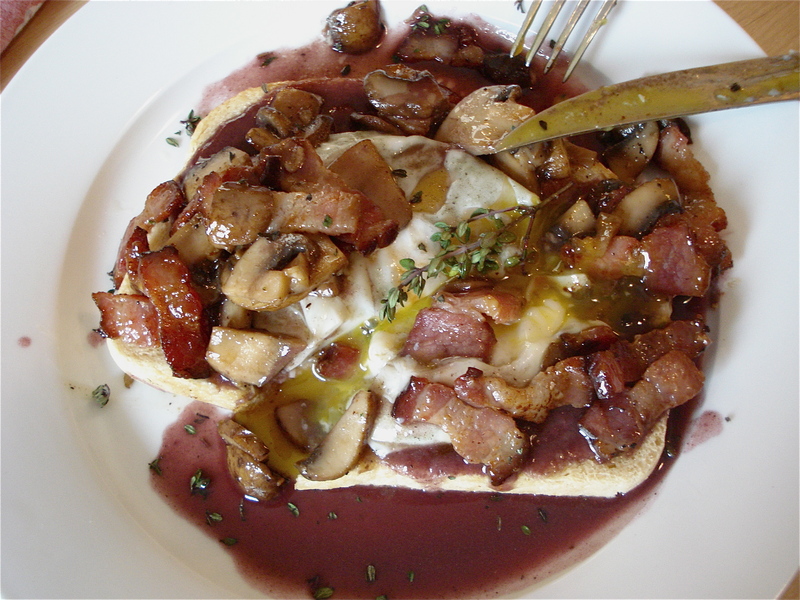 It helps to view this recipe as the glorious sum of its parts: 1) red wine reduction, 2) sautéed bacon and mushrooms, 3) poached eggs, and 4) slices of toast rubbed with garlic—cooked in that order, but assembled in reverse. I wish you a most wonderful and romantic meal. Put all ingredients for the stock in a saucepan except for the flour and butter. Bring to a boil, reduce the heat, and simmer for 30 minutes, or until the sauce has reduced by half. Drain the mixture through a colander and into a bowl, discarding the vegetables. On your chopping block, work the flour and butter together and then add it to the sauce, whisking with a fork until thoroughly mixed. Return it to the saucepan and bring to a light boil for 30 seconds. Turn the heat off, cover, and set aside. Bring 2 inches of water to a boil in a deep saucepan for poaching the eggs. In a separate skillet, fry the bacon until crisp and set aside. Without cleaning out the pan, add the mushrooms and fry until golden brown, about 5 to 6 minutes. Season with salt and pepper and set aside with the bacon. Just before serving, re-heat the sauce as needed and toast the bread. Rub the toasted bread slices with the open the half of the garlic clove, putting one slice on each plate. Place a poached egg on the bread (I did this carefully with my bare hands). Pile the mushrooms and bacon on top of the egg and bread. Pour just enough red wine sauce on top, sprinkle with fresh thyme, and serve immediately with a fork and knife. This entry was posted in Things I Make on February 4, 2010 by Carrie.